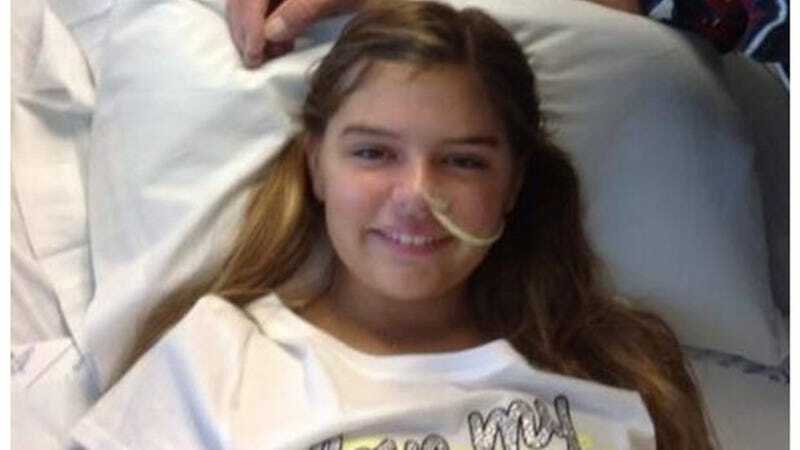 Here's some good news to kick off the Tuesday after a three day weekend: Kali Hardig, the 12-year-old Arkansas girl who was infected with a brain-eating parasite at her local water park (DO NOT GO TO WATER PARKS) is eating, drinking, smiling and talking. Go Kali! Kick those brain-eating amoeba in their brains. See how they like it. According to CNN, Kali's doctors have been in virtually uncharted territory as they treated her for the rare amoeba, called Naegleria fowleri. Kali's doctors are giving her some advanced-level Contagion type treatment with antifungal medicine, antibiotics and a new experimental anti-amoeba drug doctors got directly from the CDC. They also reduced her body temperature to 93 degrees to preserve undamaged brain tissue. Ninety-nine percent of people who get the infection die, so keep those fingers crossed for Kali.